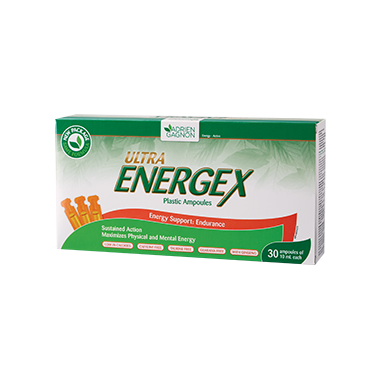 Adrien Gagnon Ultra Energex+ is an energizing tonic that fights fatigue and helps increase resistance to stress. With its fast and sustainable action it can help increase physical performance. Dosage: Adults: Take one ampoule daily, diluted in half a glass of water or fresh juice. Because certain ingredients are highly concentrated, a small deposit may occur in the ampoule. This does not affect quality. Shake well before using. Precautions & Adverse Effects: Do not use if you are pregnant, breastfeeding or if you have high blood pressure. Consult a healthcare practitioner prior to use if you have any type of acute infection. Consult a healthcare practitioner if symptoms persist or worsen.